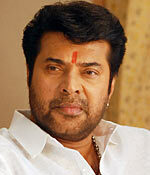 Rediff.com » Movies » What made Mammootty take up Chattanmbinadu? What made Mammootty take up Chattanmbinadu? Sometimes a film leaves you with a question that may bother you for a while: Do megastars do formula stuff eyeing acceptance at the box office? Why else would an actor like Mammootty do a Malayalam film like Chattanmbinadu? The film is a rehash of Rajamanikyam, with a few changes. And this, coming from the successful team of writer Benny P Nayarambalam and director Shafi, only doubles the disappointment. This is just a star project without any originality. So any effort to dwell into the premise of this film will be futile. But for people who need something tangible to make up their minds, here it is; Chattanmbinadu tells the story of a village on the border of Tamil Nadu (or is it Karnataka? ), which is ruled by hoodlums because of a fight between two feudal lords. Our hero Veerendra Mallaya (Mammootty), the biggest goon of them all, comes here on the behest of the weaker lord Mallachira Chandramohan (Manoj K Jayan), a drunk. The bad guy Kattapilli Nagendran (Siddique) blocks the sale of his ancestral property to tide over his financial difficulties. There are the stock comic subplots involving Salim Kumar, Suraj Venjaramoodu and Janardhanan. Then there is the back story, which pops up in bits and pieces, in black and white. Everything comes together in a prolonged climax. Chattanmbinadu succeeds in its basic purpose ie. cashing in on Mammootty's aura by making him look stylish with a designer beard, white outfits and expensive sunglasses (again reminiscent of Rajamanikyam). Instead of dialogue laced with the Thiruvananthapuram accent, as in Rajamanikyam, here his dialogues have a Kannada flavour. The supporting cast of Vinu Mohan's Murugan as Mallaya's educated stooge (very similar to the role played by Rahman in the original) has a few comic gags and is also instrumental in making the second half heavy. The female lead Lakshmi Rai does not have anything more than ornamental value. Mythili, as the second lead, plays Murugan's mute love interest and is not much of a consequence in the scheme of things. Though Benny P Nayarambalam's script relies heavily on humour, it lacks the sharpness of his previous works. In the final analysis, we can say that law of averages has caught up with Mammootty, whose last few outings before Chattanmbinadu were very good.